The project has been invited to be presented during the 5th Atlantic Stakeholder Platform Conference 2018 in Vigo (Spain). 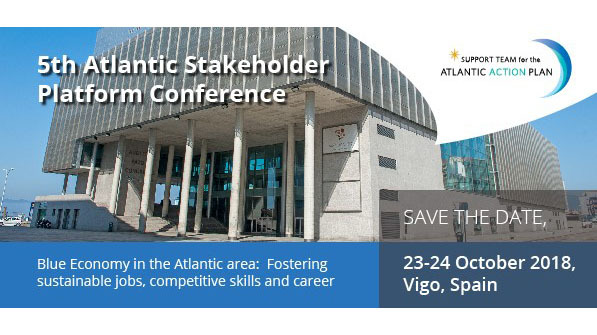 SAFER has been invited to take part in the 5th Atlantic Stakeholder Platform Conference 2018 that will take place in Vigo (Spain) on 23-24 October. The theme will be on actions to boost youth employment in the maritime domain and will gather political leaders, maritime clusters, enterprises, academic institutions, funding donors and investors from all across the Atlantic seaboard. More specifically, this conference will focus on how to pursue a career in the maritime sector, how to obtain the necessary skills and embrace innovation without negatively affecting employment in the Atlantic area, while at the same time emphasising present opportunities for project development relevant to the Atlantic strategy and to the objectives of the Atlantic Action Plan. SAFER will be presented in the workshop The Atlantic Area Programme: fostering transnational cooperation to promote a BLUE future, organized by the Interreg Atlantic Area Programme. You can find here more details about the conference.